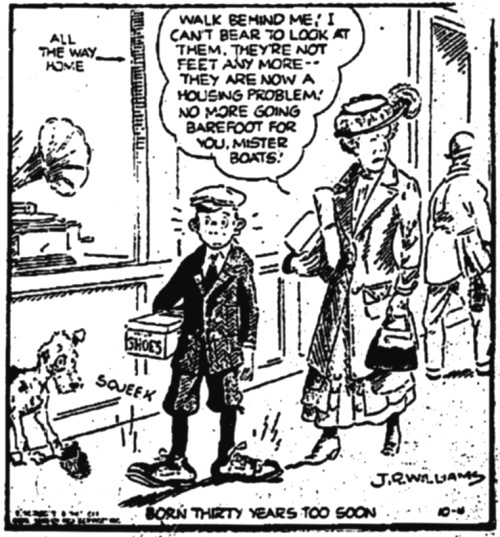 Today’s comic comes from July 3, 1969, when bare feet reached their most recent peak. The strip is Hi and Lois, written (back then) by Mort Walker and Dik Browne. I can answer that. It’s the one who doesn’t let them atrophy all day long. Six Chix is a comic strip written by six different women. This one was done by Stephanie Piro. This strip appeared on August 16, 2014. I think I see at least one side effect I find useful . . . Since it’s still near the start of school, let’s go with another comic with that standard barefoot trope. This one is from October 5, 1948. It’s from the strip Out Our Way by J. R. Williams. I still find it odd that growing feet are blamed on going barefoot. It’s as if they’ve never see a puppy before; at that point of adolescence, the feet grow first (and then the kid/puppy grows into them).